Created by MFC, a new ‘iBus’ tool lets you connect to the Apple Watch maintenance port for interfacing with iTunes on a Mac. 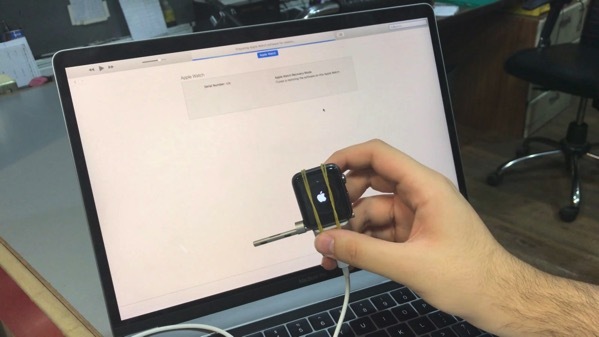 Once the Apple Watch has been detected by iTunes, it can be placed into DFU mode, a process that’s similar to entering DFU mode on an iPhone (via 9to5Mac). Entering DFU mode on the Apple Watch requires holding down the Digital Crown and Side button for 10 seconds, and then releasing the side button while still holding down the Digital Crown. All of this is performed while connected to a Mac via the iBus and a Lightning cable. Once done, iTunes will recognize that your Apple Watch is in DFU mode, and prompt you to select an IPSW file for restore.